Richell’s smile was mesmerizingly infectious, her hope in a better future almost audacious. We had been chatting in a yellowy darkness that reminded me of my village some 7000 kilometers and two oceans away. Everything here was so similar, so reminiscent of those 200 watt yellow bulbs that hanged precariously in decaying holders and gave a twinkling yellow light that sickened more than illuminating. They hanged on, nonetheless. So did Richell, a bright and beautiful young girl in Cavite. We sitting in the verandah in front of her room that she shared with seven others, yes seven others. All she had of her own was a bunker bed with no privacy other than a big and coarse curtain that could lock her 6 into 6 feet space out of others’ eyesight but could not stop noise, or even light from seeping in. Yet she laughed, and laughed a lot. She dragged me inside to have a ‘feel’ of her life and once inside, proudly showed me the teddy bear she had bought, no got as she corrected herself, a few days back. Her eyes twinkled when she talked of her dreams. She had no qualms against sharing them with me, a rank stranger until just half an hour ago. Richell’s dreams seemed so out of place in the verandah where we were sitting. The point, however, is that she had the courage to chase her dreams unlike the girls of my village who would be sacrificed on the altar of patriarchy for the ‘crime’. She could dream sitting in that sickening light in the verandah, which unlike my village was not located some 800 kilometers away from the national capital but was right at the perimeter of it. It was not in a nondescript village either but inside the biggest Export Processing Zone, as the Philippines government prefers to call the obnoxiously mushrooming Special Economic Zones, in the country. 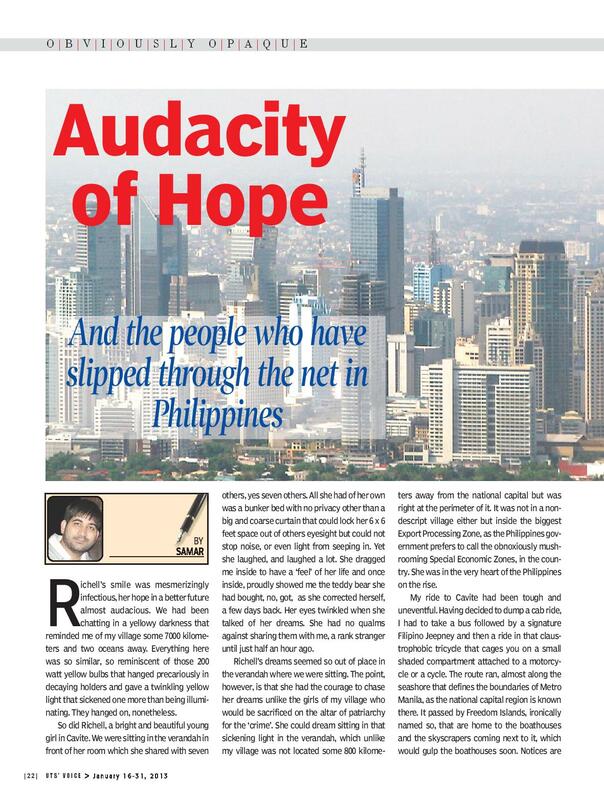 She was in the very heart of the Philippines on the rise. My ride to Cavite had been tough and uneventful. Having decided to dump a cab ride, I had to take a bus followed by a signature Filipino Jeepney and then a ride in that claustrophobic tricycle that cages you on small shaded compartment attached to a motorcycle or a cycle. The route ran, almost along the seashore that defines the boundaries of Metro Manila, as the national capital region is known there. It passed by Freedom Islands, ironically named so, that are home to the boathouses and the skyscrapers coming next to it, which would gulp the boathouses soon. Notices are already out and served on them. Richell’s journey to Cavite had been much tougher. 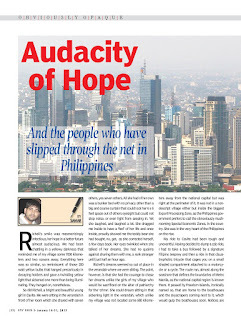 Masabate, the city she calls home, is not merely geographically distant from Manila, it is almost a different country, poorer and lacking of opportunities. But then, her old and ailing parents lived there, they still do, and it was there where she was pursuing her college degree in Information Technology. Ask her what brought her, then, here and what you get is another burst of laughter that could hardly conceal the pain seeping through her eyes. No work there, why else, she replies. Ask her about the IT course that she left midway and she points towards a roommate, she has an IT degree as well, no use. The roommate nods, giggles and then all of them burst into a collective laughter. Not that coming here has done anything much to Richell and thousands of other workers who swarm the streets of Cavite with every change in the shift. They all work like machines and get paid in what can be dubbed as peanuts. They work in glassy buildings that claim to offer world class work environment and retire to these dingy dungeons for rest. I do not go to movies they are very costly, Richell tells, and laughs. We borrow dvds from friends and watch them on cheap dvd players that is there only source of entertainment, she adds. Laughter, I realize, is not born merely out of the sheer audacity of their hopes. It is there weapon to reassure them that they have not lost everything, that hope is what keeps them afloat in a country that alienates them from their own labour, from their own bodies. It is intoxicating. It gives them the delusion they need the most. As Irene certainly does. A single mother who came to Cavite from Tacloban a few years back cannot go home to visit her children. A single return trip to her city that is 14 hours away will cost her almost a month’s salary in a country that had privatized its public transport system long ago in its quest of becoming a tiger economy. She would better save that money and go only once a year, on Christmas perhaps. Darkness can neither conceal the wetness the thought has brought to her eyes nor the glint born out of the idea of a family gathering. Richell is saving money for her marriage; Irene informs me, perhaps for getting the attention off her and gets joined in by her in giggling. Even in the middle of all the mayhem crony capitalism has brought to their lives, the idea of both the girl and the boy saving for marriage seems so liberating. Forget the impossibility of choosing one’s life partner on her own part in a country known for ‘dishonour killings’, it makes me think of the blessed country where marriages are more like extortion for the bride’s family and inflict a terrible, and often irrecoverable, economic loss on them. You have a boyfriend; I ask Richell and see her blushing for the first time. The reply, hastily put together with an invitation to have dinner with the group, is a coy ‘not yet’. They are all on Facebook, my colleague informs. Yes we are, is the collective reply, almost an imitation of the collective laughter. They are all on Facebook, and they are all very different there. Facebook offers them all that this world does not and they would not let the opportunity go waste. It is the only place where their wants have a tangential meeting with their realities. It gives them an escape route. It offers them the luxury of acting like the one they want to be instead of what they really are. Pretension, sometimes, is the only thing available to save the sanity of someone condemned to stand on the same assembly line for years on one end. And then, there are rare but legendary tales like someone getting into a very happy and prosperous marriage with a ‘fb’ friend, someone getting an offshore job and so on. They need a hinge on which their lives can turn, and they would not let go of even the weakest one. Why should they? The hinge is what is not available to the dwellers of floating Boathouses in Freedom Islands in Paranaque City. Forget Facebook, they do not have even electricity and water supply in their houses. 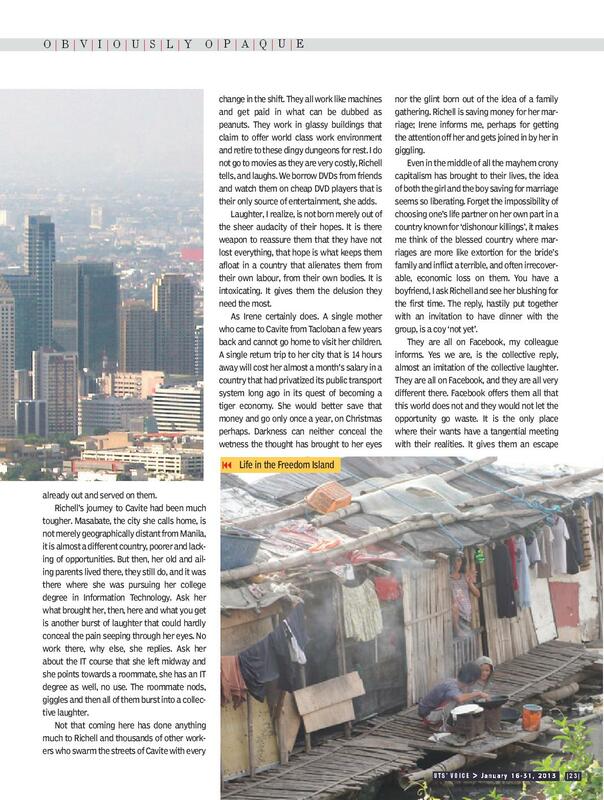 They do not live on the periphery of Metro Manila, they live right in the middle of it. They are trying to relocate us to mountains, Maribel tells me. Relocating a community of fisher folks to mountains, can anything get more absurd than this, she adds with a blank face. She would definitely want to have electricity, and water and all the other amenities the government is promising them but she knows that the government had promised them the same thing six years ago when they had persuaded them to relocate to this place. I was missing Richell’s laugh. Despite all assaults, she had the hope for a future intact in some corner of her heart, Maribel did not. She had no hinge to turn her life. Neither do the vendors of Rizal National Park. Recently fenced from the main park, they are trying to survive the assault of ‘Fever’ as they refer to the current director who is hell bent on throwing them out after having leased the right to vend inside the park to a Korean chain. I have been living here since 1972, Freddie tells me. My wife died here, he adds. He had slept in the makeshift bed inside his stall ever since. They want to throw me out of this place, but where to is what he asks. There are all real people caught in a flux. They are the ones who produce almost everything that makes our lives easier. They are the hinges on which our lives turn for better. They, though, are caught in a flux. They are the ones getting slowly dehumanized into mere statistics. They are the ones who have fallen off the nets fishing for development. They are the future imperfect that awaits us following the path Philippines have taken till now. All I got back on my return flight was Richell’s laugh, uncontrolled and unabashed. And her belief in future. The audacity of that belief make me believe in humanity. Can we save the smile for our children is the question haunting me. I do not want to hit a wall for an answer.